Calling All Homesteaders! Alone recently wrapped up their first season on The History Channel. Some friends and I were discussing the show and what we would do different when one of my friends commented, "When was the last time you were on an adventure? Every man needs an adventure." Once we have an application on file, even if you've missed this casting window, we can keep you in our system for future seasons. Best of Luck and thank you for watching the show!" In the meantime, I read your application and wanted to see if you would be interested in another series we are currently casting! 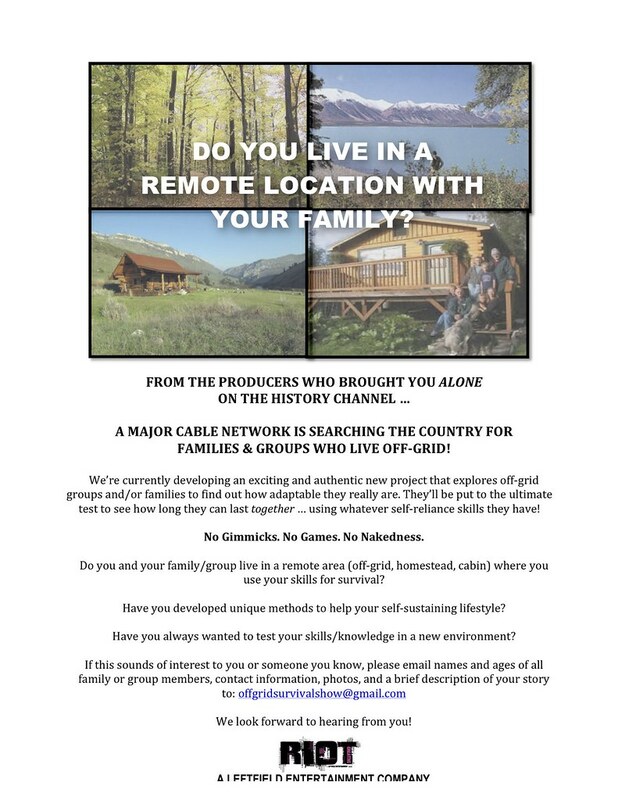 We’re developing an exciting and authentic new project that explores off-grid groups and/or families. They’ll be put to the ultimate test to see how long they can last together using their self-reliance skills. I attached the flyer with more information. If you think it's a good fit for you or someone you know, feel free to reach out to us! The best and quickest way to reach our team for this show is at offgridsurvivalshow@gmail.com.